Sprites aren't being displayed in certain titles regardless of settings used. This issue is present in Mega Man ZX Advent (NA) and Doraemon: Nobita to Midori no Kyojinden (JP), there may or may not be other games with this issue but these were the only ones that I could confirm. I tried these games on the most recent build from appveyor (d33faecd) and this issue is still present. Went back and tested these games on random builds from appveyor starting with the first build made 7 months ago and found that sprites were working properly through commit 51163c33. Commit 66b5da1c seems to have been the one that broke sprites for these games. 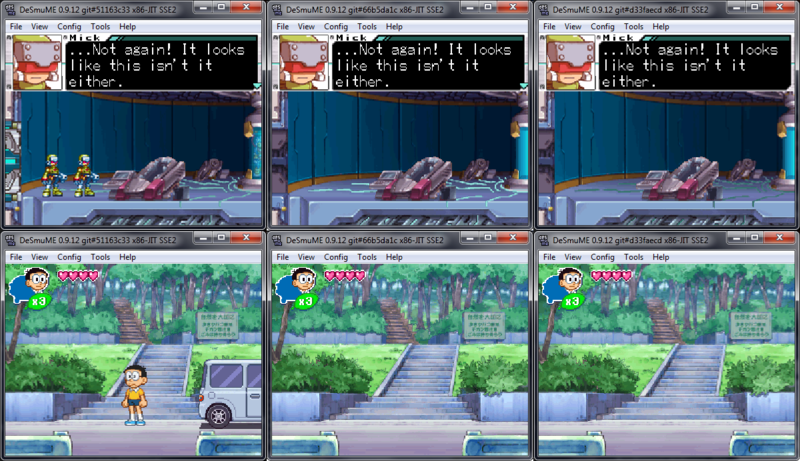 The screenshots below show sprites working in 51163c33 and then not working in 66b5da1c and d33faecd. Skimmed through open issues to see if the commit had any other known problems and it seems there's one ticket for a rendering regression in Lack of Disco. I tried building master with line 2356 changed to TRUE as zeromus said and doing so fixes sprites in both games. Updated link to line 2356.
ok, got all 4 things working at once. thanks for your research. With the sprites working I noticed some unrelated regressions with the OpenGL renderer in Mega Man ZX Advent, finishing the post for it now. Oh, while looking into the OpenGL issues I noticed something about this issue that I hadn't before. Just to be clear this is about the older builds, before the fix in 759a039e. It's not relevant to the master. In both games the missing sprites show up after entering a new stage/zone or after reloading/resetting the current stage/zone (by dying). Like I said it probably doesn't matter since sprites are now working in master but I felt this should be noted anyway.